The Xerox Color 800 Press prints at 2400 x 2400 dpi for excellent sharpness and uniformity, and use Xerox’s new low-melt Emulsion Aggregation (EA) Dry Ink, which delivers an offset-like finish. EA Dry Ink also requires less energy to manufacture than conventional toners. Printing 80 pages per minute can produce high definition image quality on a wide range of paper stock. 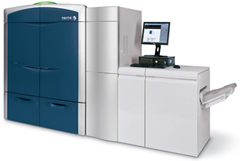 An optional clear dry ink station, a feature exclusive to these devices within the Xerox color portfolio, amplifies full-color jobs. This clear, dry ink allows for images and text to be highlighted for visual impact, or digital watermarks applied for artistic effect or security. It is also beneficial for variable-data applications using Xerox’s XMPie software, as it displays personalized content in more vivid ways.